Music attuned with frequencies for relaxation and healing from Dr. Weil's music series. Western science has proven what ancient traditions have known for centuries: sound has the power to heal. For years, Dr. Andrew Weil and Kimba Arem have incorporated this knowledge in their practices. Now they team up to offer Dr. Andrew Weil Presents: Vibrational Sound Healing, music to help listeners awaken their natural healing abilities using clinically demonstrated techniques and frequencies found in nature. The latest in Dr. Weil’s self-healing music series, this therapeutic soundscape uses alpha-theta encoded binaural beats, holophonic sound technology, and compositions by Arem specifically designed to entrain listeners into brainwave states conducive to problem solving, tranquillity, and healing. 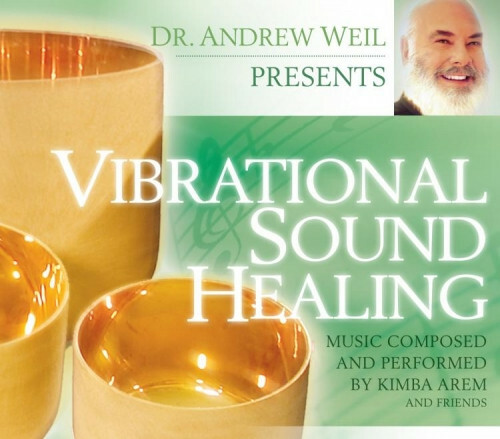 With ancient flutes, Tibetan bowls, crystal bowls, didgeridoo, and other soothing instrumentation, Dr. Andrew Weil Presents: Vibrational Sound Healing features powerful, subtle frequencies chosen for their ability to transform the mind, body, and spirit. listening to this while at work really helps to alleviate the typical day to day stress.